Bayou Renaissance Man: Weekend Wings #19: The Greatest Air Race Of All Time? Weekend Wings #19: The Greatest Air Race Of All Time? Air travel between England and Australia was slow to get under way, largely due to the enormous distances involved and the many navigational hazards en route. Both pilots were knighted for their achievement, and the two Sergeants were commissioned. The four shared the £10,000 prize money equally between them. Over the next thirteen years, there were other flights to Australia from England and the USA, notably the first trans-Pacific flight by Sir Charles Kingsford-Smith and his crew in 1928. They flew a Fokker F.VIIb/3m trimotor aircraft named the Southern Cross. During that same period there were flights from Australia to other countries, and many other record-breaking feats in aviation history. We've looked at the crossing of the Atlantic in the last three Weekend Wings articles, and there were many other flights across Africa, Asia, and other places. Aviation was still in its pioneer days in many ways - as the large number of fatalities demonstrated all too clearly. The city of Melbourne in Australia was founded in 1835. In the early 1930's, as its centenary approached, the leading citizens of the city began to consider how best to celebrate and commemorate the occasion. The world was still in the grip of the Great Depression, with many countries only slowly beginning to emerge from their economic malaise. Sir Macpherson Robertson was the founder of MacRobertson Steam Confectionery Works, a candy-making business. He had become a leading businessman in Melbourne. He offered to sponsor a great air race from England to Melbourne, to the tune of fifteen thousand pounds (US $75,000, worth about $1.5 million today). 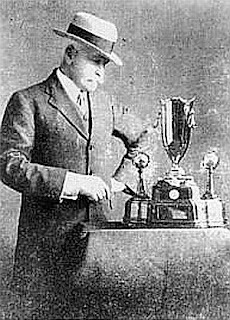 He is shown below with the MacRobertson Trophy, named after his business, to be presented to the winner. The race would be decided in two categories. For the fastest speed, a first prize of £10,000 (equivalent to about $50,000 at then-current exchange rates, and about $1 million today) would be awarded, plus a gold cup worth £500. Second prize would be £1,500, and third prize £500. For the handicap section, a first prize of £2,000 was offered, and a second prize of £1,000. Aircraft would be handicapped depending on a number of factors, including speed, payload, range, etc. 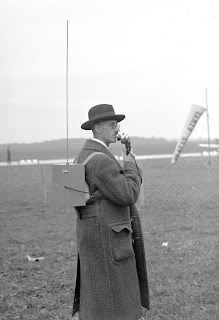 In the event that an aircraft placed in both the speed and the handicap races, the pilot would elect which prize to receive. All prizes would be paid in Melbourne in Australian currency, and all pilots finishing the course within sixteen calendar days would also receive a gold medal. There were few rules. Any individual, organization or nation could enter, and there were no limits on the type or power of the aircraft. Five compulsory checkpoints were set up, at Baghdad, Iraq; Allahabad, India; Singapore; Darwin; and Charleville, in east central Australia. Pilots were free to stop at 20 other points where fuel and facilities had been provided, or make their own arrangements, provided that they also stopped at the five compulsory checkpoints. The pilot(s) had to complete the entire journey, and could not be replaced en route. Each aircraft had to carry food and water for its crew sufficient for three days, and lifebelts for each person for over-water flight, as well as smoke signals. Minimum instrumentation was specified, and aircraft had to bear a certificate of registration from their countries of origin, testifying that it conformed to the minimum airworthiness requirements specified for the race. The announcement of the race aroused enormous international interest. It's difficult for us today to comprehend the magnitude of this event in the days when aviation was only just becoming something normal, not yet fully accepted as a genuinely useful means of transportation. Airline travel was still the exception rather than the rule, and accidents were frequent. A race of this enormous length (approximately 11,300 miles) was a huge challenge to the aircraft of the day, particularly when speed was emphasized. There was also the factor of the Great Depression: news of the race helped to lift people's spirits, helping them to focus on something outside the economic misery of their times. The race is reported to have received greater coverage in the news media than the attack on Pearl Harbor in 1941, the Second Battle of El Alamein in 1942, or the launch of the first Sputnik in 1957 - an indication of how great was the interest in this event. The interest from the aviation community was equally overwhelming. Many of the world's most prominent aviators (and those who would become prominent) entered: from the USA, Jacqueline Cochran and Roscoe Turner; from England, Tom Campbell Black, Amy Johnson and Jim Mollison; from Ireland, James Fitzmaurice; from Australia, Don Bennett and Ray Parer. They are shown below. Top row, left to right, Cochran, Turner, Campbell Black and Johnson; bottom row, Mollison, Fitzmaurice, Bennett and Parer. Over 60 aircraft entered for the race, but they were cut to 20 by the time it started. 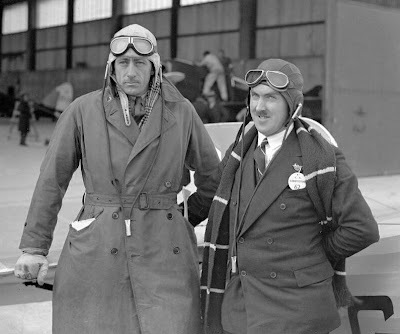 Difficulties included differing national standards for certificates of airworthiness, leading to the Royal Aero Club and the organizers rejecting some aircraft as being not airworthy; a lack of compliance with even the minimal instrumentation standards laid down for the race; entrants not allowing enough time to have their aircraft inspected for compliance (which eliminated James Fitzmaurice, for example, who must have been highly favored to win - he was excluded from the race the night before it began, because his aircraft had not completed load testing for fuel capacity); and sponsorship and funding problems. The organizers tried to provide as much information as possible to the competitors. They issued route maps of the race, as shown below. This one has been compiled from three different scans (at different resolutions) of different portions of the map, which means it's not all to the same scale: but it shows the direct routes to the five compulsory checkpoints, plus the 22 intermediate stops arranged for shorter-ranged aircraft. It's an interesting piece of aviation history. I wish I'd been able to find a full scan of the whole map, all in the same scale, but unfortunately one doesn't seem to be available. From the point of view of aviation history, the MacRobertson Trophy race is particularly important. It fell towards the end of the so-called 'Golden Age' of aviation, when the pioneers who'd blazed the trails were giving way to regular air routes and the commercialization of what had been a hazardous sport for the wealthy (and those with wealthy sponsors). The aircraft that entered the race illustrate this very well. 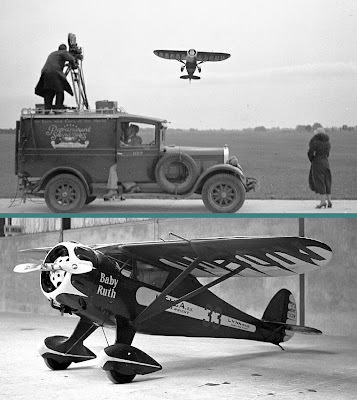 Some came from the old-fashioned biplane and fabric construction era. Others were innovative in their use of traditional materials in new ways, and would give rise to other famous aircraft in their turn. Yet others used completely new materials and construction methods, which would prove to be the foundation of the future of aviation. Let's take a look at a few examples. The Fairey III was a reconnaissance biplane that first flew in 1917. Later versions, produced in the 1920's, including an all-metal fuselage (and, later still, all-metal wings). 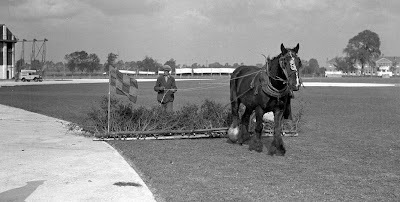 One of these later types, a IIIF, took part in the race, and is shown below. 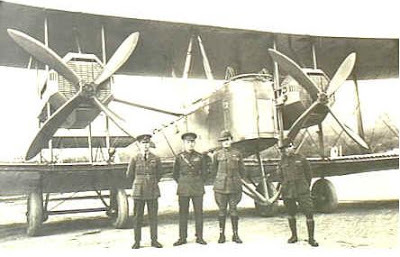 It was piloted by Flying Officer C.G. 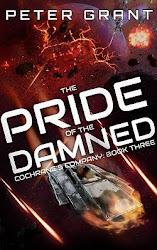 Davies and Lieutenant Commander C.N. Hill. Unfortunately, they were unable to reach Melbourne within the sixteen-day limit for the race, but pressed on, finally getting there on November 24th, 1934 - a valiant effort. Another Fairey aircraft to take part was the Fox. Two of these biplanes were entered. One, piloted by Ray Parer and G. Hensworth, also failed to complete the race within the sixteen-day limit, eventually arriving on February 13th, 1935. Their aircraft is shown below, before the race. The second Fox had a tragic accident. Flying Officer Harold D. Gilman and James K. Baines (shown below) crashed near Palazzo San Gervasio after taking off from Rome, Italy. Both were killed. 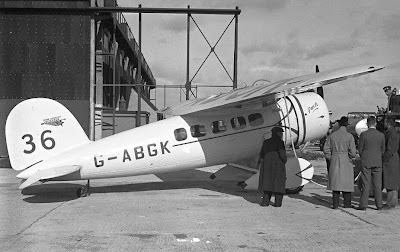 The de Havilland Aircraft Company of Britain was one of the most prolific and innovative manufacturers in the world. It had produced a large variety of very good aircraft in earlier times, and was well represented in the MacRobertson Trophy race. The youngest entrant, C. J. 'Jimmy' Melrose, was only 20 years old. 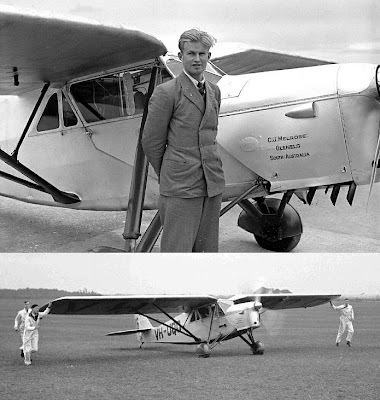 He'd just set an Australia-to-England record in his de Havilland DH.80 Puss Moth aircraft, named My Hildegarde for his mother, and entered the MacRobertson Trophy race to get home again! His Puss Moth was a high-wing monoplane, part of the long line of de Havilland 'Moth' biplanes and monoplanes. He would finish seventh in the speed category and take second place on handicap - an outstanding achievement. His would also be the only Australian aircraft to finish within the allotted time. 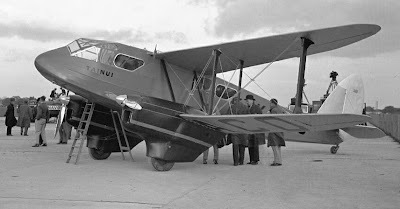 Another de Havilland aircraft in the race was the Tainui, a DH.89 Dragon Rapide airliner. This New Zealand entry was flown by Squadron Leader J. D. Hewitt and Flying Officer Kay. They would finish fifth overall and third on handicap. All of the de Havilland aircraft illustrated so far were of wood and fabric construction: but the company was both technologically innovative, and patriotic. It was aware that the threat from new metal-construction American aircraft was very real. 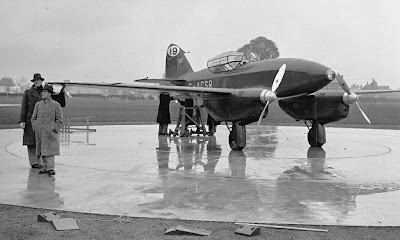 A year before the race, de Havilland announced it would offer a purpose-built racing aircraft, to be designed specifically for the MacRobertson Trophy event. 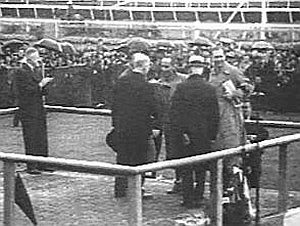 Orders had to be placed by nine months before the race. 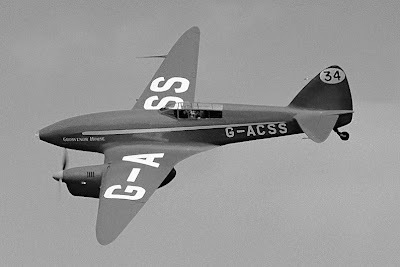 Only five of the DH.88 Comet racers were built: but they were to make history - and a substantial contribution to British aviation during World war II. The DH.88 was built of stressed plywood. The de Havilland engineers reasoned that such a structure would provide great strength for the lowest possible weight. A very detailed account of the design, construction and operation of the Comet may be found here. That Web site also covers some of the other aircraft in the race. The use of stressed plywood was so successful that de Havilland continued to use it for future aircraft, such as the extremely elegant and fast DH.91 Albatross airliner of 1938-39. 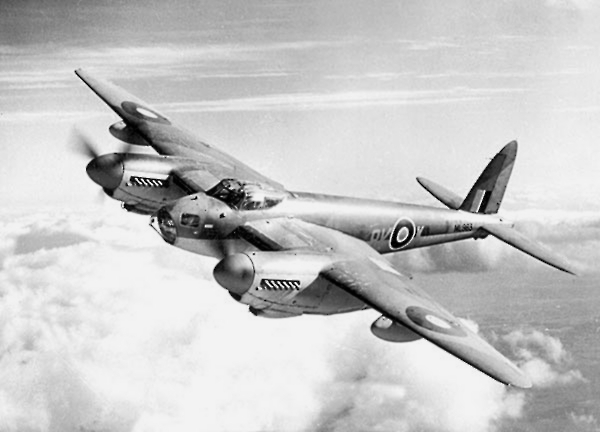 This construction method culminated in the world-famous DH.98 Mosquito multi-role aircraft of World War II (covered in the very first Weekend Wings). One can trace a direct line of descent from the 1934 DH.88 to the 1940 DH.98. I'm sure Luftwaffe pilots would rather the racer had never existed, as its descendants gave them a severe headache! de Havilland sold the DH.88's at far below their production cost, reasoning that it was only in this way that a British aircraft (with sufficient performance to win) could be entered for the race. 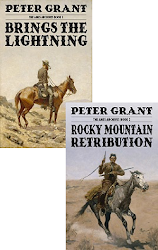 They sold three to prospective participants, and their vision was to be amply rewarded. 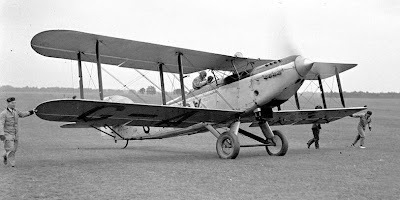 Another British manufacturer was Airspeed Ltd. One of their AS.5 Courier single-engined monoplanes was entered in the race by Squadron Leader D.E. Stodart and Sergeant K.G. Stodart. It came sixth overall, with an elapsed time of 9 days 18 hours. This innovative monoplane was one of the first aircraft to feature a retractable undercarriage. 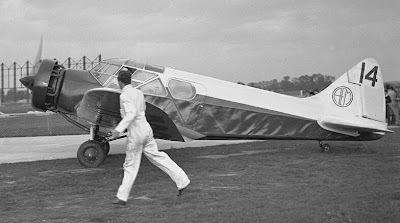 The Courier was enlarged into the AS.6 Envoy, a twin-engined version of the monoplane, also with retractable undercarriage. A single example of the AS.6 was modified to become the unique AS.8 Viceroy, built to the specifications of Captain T. Neville Stack and Sidney L. Turner to participate in the MacRobertson Trophy race. It failed to finish, encountering brake problems at Athens, Greece. An unusual and extremely innovative design was the Pander S.4 trimotor monoplane, built by H. Pander & Sons in the Hague, Netherlands. It was designed to make the trip from Holland to Batavia (today part of Indonesia) in less than 50 hours, carrying mail. 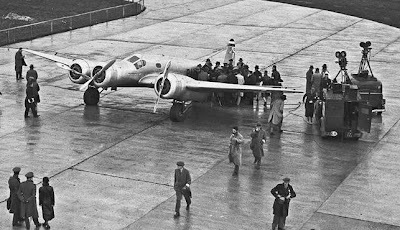 To that end, it had three engines, a sleek, streamlined fuselage, and some unique features. It successfully made a test flight to Batavia and back in 1933. The wing was thick, to allow for large internal fuel tanks, and the undercarriage used wide, fat tires, inflated to low pressures, to allow the plane to land on soft or muddy surfaces. The wings had strange fixed 'winglets' (for want of a better word) above the outer rear surface, looking not unlike the spoilers one finds at the rear of some modern sports cars. They can be seen on the outboard wings in the first picture above, and in this rear view. There were so many advanced innovations on the S.4 that it attracted enormous interest when it arrived at RAF Mildenhall to start the race. Below you can see the reception committee! 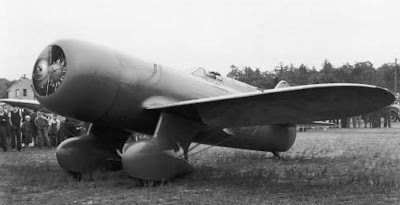 Only one prototype S.4 was built. 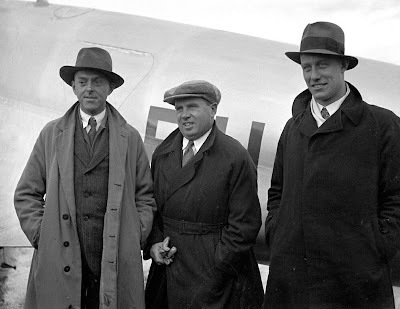 For the MacRobertson Trophy race, it was piloted by Gerritt Johannes Geijsendorffer (center, below), with co-pilot Dirk Lucas Asjes (right) and radio operator Pieter Pronk (left). Sadly, it did not finish the race. On take-off at night from Allahabad in northern India, it clipped a high-standing searchlight with a wing. Reports suggest that the searchlight blinded the pilots, who could not see that their wing was too close to it. The hundreds of gallons of aviation gasoline in the wing tanks sprayed out, and were ignited by sparks from the engine exhaust. Trailing burning fuel, the aircraft crashed. The three crew managed to escape, with help from bystanders, although Geijsendorffer and Asjes were badly burned. Two bystanders were also severely injured. The aircraft was completely destroyed. The United States fielded a strong presence. A brand-new Douglas DC-2 airliner, named Uiver, was entered by KLM Royal Dutch Airlines. This sleek, all-metal monoplane with retractable undercarriage was faster than most of the other aircraft in the field. Uniquely, KLM insisted on running it as a commercial flight. It undertook the race with four crew and three paying passengers! 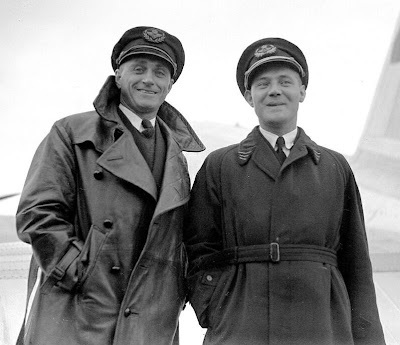 It was piloted by Captain K. D. Parmentier (right) with co-pilot J. J. Moll (left). The DC-2's great rival, the Boeing 247, was leased from United Airlines by Roscoe Turner for the MacRobertson Trophy race. It was similar in size to the DC-2, but accommodated only 10 passengers compared to the latter's 12, and had the disadvantage that the main spar of the wing ran through the cabin, forcing passengers and crew to climb over it. The aircraft entered for the race had all passenger seats and other fittings stripped out, to make room for eight additional fuel tanks. An extremely interesting American entry was the Granville Gee Bee R-6H. Only one was built, the last in the line of Gee Bee racing aircraft developed by the Granville brothers in the 1920's and 1930's. They had a reputation for being viciously unforgiving aircraft, that would crash at the slightest inattention on behalf of the pilot: but they also had extremely high performance for their day. For example, James Doolittle piloted a Gee Bee R-1 to victory in the Thompson Race on September 5th, 1932 - and lapped all the other competitors in the process! The R-6H was powered by a 675hp. Pratt & Whitney Hornet engine. 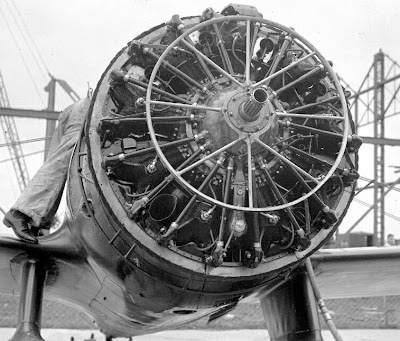 The photograph below, showing the aircraft with propeller and cowling removed, is a good illustration of this nine-cylinder radial engine. The R-6H, named 'Quod Erat Demonstrandum', or 'Q.E.D. ', was piloted by Jacqueline Cochran, with co-pilot Wesley Smith. Regrettably, the first leg of the race was also their last. They flew non-stop to Bucharest, Romania, over the Alps. Reportedly the air was so cold at altitude that Ms. Cochran had to be lifted from the plane after it landed. The aircraft's flaps were damaged during the landing, and it could not continue with the race. The R-6H was later used by a Mexican pilot, Francisco Sarabia, in an attempt to establish a new record from Mexico to New York City. He renamed it El Conquistador del Cielo. Sadly, it crashed on June 7th, 1939, killing him. It was restored, and is today preserved in a museum in Mexico, although no longer in flying condition. The Lockheed Vega was a high-wing single-engined monoplane, made famous by Amelia Earhart and Wiley Post in their record-breaking flights. One was entered in the MacRobertson Trophy race, flown by J. Woods and D. Bennett. Interestingly, the Vega used the same plywood stressed-skin construction method as the de Havilland DH.88. However, Lockheed did not pursue this, choosing to switch to metal construction for its future designs. The Vega did not complete the race: it overturned on landing at Aleppo. Its crew survived with only minor injuries. Finally, a Lambert Monocoupe D-145 named Baby Ruth was entered in the race by J. H. Wright and his crew from the USA. Only one of this particular model was built, specially for the MacRobertson Trophy race. It withdrew at Calcutta, India, with mechanical problems. As the start date approached, aircraft flew in from all over, and the atmosphere at RAF Mildenhall was electric. 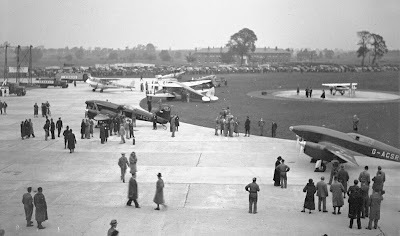 The organizers and the Royal Aero Club were run off their feet checking aircraft for conformity to the regulations, issuing maps and other information, and trying to accommodate the thousands of spectators who thronged the airfield. The race began on October 20th, 1934. The hangar doors opened at 3 a.m., and take-off time was set for dawn at 6.30 a.m. Over 60,000 spectators showed up - a sign of how immensely popular the race was with the general public, and how it had caught their imagination. At 45-second intervals, the participating aircraft roared down the grass field at Mildenhall and climbed slowly away, heavy with fuel. 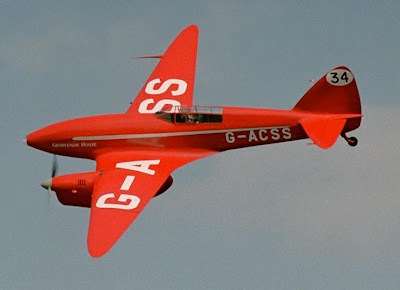 First off were Jim Mollison and his wife, Amy Johnson, in a de Havilland DH.88 Comet named Black Magic. They were considered 12-1 favorites to win the race by British bookmakers. Last away, fifteen minutes later, were Captain Tony Stack and Sidney Turner in their Airspeed AS.8 Viceroy. They carried with them film of the start, to be shown in Melbourne on their arrival. The course covered 16 countries and three continents, required night & day flying over country perilous with jagged mountains, snake-infested jungles, deserts, hurricanes and typhoons. Toughest stretch was across the Syrian Desert where blinding sandstorms sometimes rise 20,000 ft. and huge kitebirds menace aerial navigation. Not much easier was the 2,210-mile jump from Allahabad to Singapore, with its Bay of Bengal water hop nearly as long as the North Atlantic. To the participants in the race Lloyd's of London gave a 1-in-12 chance of being killed. Purely a long-distance speed race, the MacRobertson Derby was a free-for-all with virtually no restrictions. Chief requirement was that contestants land at five specified control points: Bagdad, Irak; Allahabad, India; Singapore, Malay Straits; Darwin and Charleville, Australia. The finish was at Melbourne's great Flemington Racecourse, where more than 100,000 persons awaited the winner. First Day. First to drop out of the race were Wesley Smith and Jacqueline Cochran, sole U.S. woman entry. They quit at Bucharest. 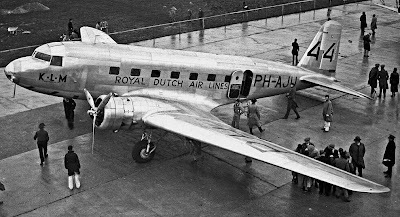 First plane into Athens was the Douglas D.C.-2 flown by Pilots J. J. Moll and Koene D. Parmentier of Royal Dutch Airlines. Their longtime service on the Amsterdam-Batavia airway (three-fourths of the MacRobertson route) gave them a decided edge over other contestants. On board their plane were three paying passengers -- two bankers and famed German Aviatrix Thea Rasche. Turner reached Athens an hour after the Dutch entry, complained of a splitting headache. Speeding non-stop from England, the Mollisons leaped sensationally into first place when they swooped into Bagdad, first control point, hours ahead of the field. There Amy kept Irak officials waiting while she took a hot bath, her husband waiting while she made a little speech. Hardly had the dust of the departing Mollisons settled on the Bagdad field when in dropped a second British plane, piloted by Flight Lieutenant Charles William Anderson Scott and Captain T. Campbell Black, famed for his spectacular rescue of Ernst Udet, German War ace, in the desert wastes of the treacherous Nile country three years ago. Lost, Scott & Black had made a previous stop at Kirkuk, where they beg-borrowed 20 gallons of "petrol" to continue. 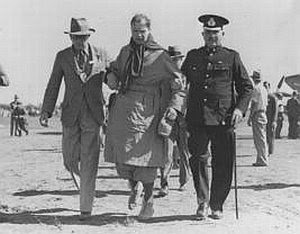 They left Bagdad close on the Mollisons' heels, flew straight to Allahabad, second control point, to take over the lead. The Mollisons had landed at Karachi to refuel, had taken off only to be forced back ten minutes later with landing-gear trouble. Seven hours behind the leader was Roscoe Turner. At Bagdad he became confused, made a down-wind landing, nearly cracked up. 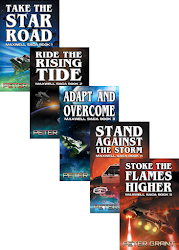 Stuck in Paris was Captain Stack with his complete newsreel of the flight's start. Second Day. Still far in the lead were Britons Scott & Black in their De Havilland Comet GROSVENOR HOUSE. Behind them as they sped over the Bay of Bengal for Singapore were Parmentier & Moll. At Allahabad these two had lost valuable minutes when they carelessly took off without one of their passengers, had to return to pick him up. Two other Hollanders, Asjes & Geysendorfer, smashed their undercarriage landing at Allahabad. 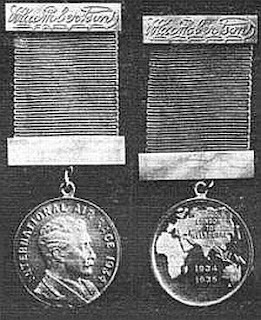 Their mishap put Turner & Pangborn in fourth place, which soon became third when they passed the Mollisons at Karachi. The Mollisons left there two minutes later, got lost, developed motor trouble, limped back to Karachi. 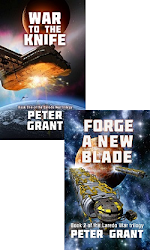 Turner & Pangborn likewise got lost, nearly ran out of gas, finally landed at Allahabad. First accident of the race occurred at Aleppo, Syria, when Australians Woods & Bennett turned over in landing. Scott & Black, pushing their engines to the limit, swept into Singapore that night with heavy black smoke pouring from their exhaust. Alarmed field officials rushed out with fire engines. Scott asked for two glasses of beer, danced with nervous impatience to be off. 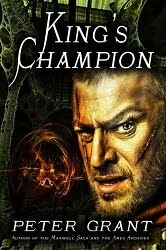 Onetime light heavyweight champion of the R.A.F., he was visibly suffering from the terrific strain of his flight. Eight hours after Scott's departure, Parmentier reached Singapore. Said that doughty Dutchman: "I'm in a great hurry." Back at Karachi the Mollisons got off a third time, had engine trouble all the way to Allahabad, were grounded there with a broken oil line. Hopelessly behind in the race was Captain Stack with the newsreel of the start at Mildenhall. Grounded at Marseille, harassed by motor trouble, he announced he would continue as an "amateur." Third Day. Biggest sensation of the race came just before dawn of the third day, when burly Lieutenant Scott and dapper Captain Black flew their scarlet Comet into Darwin. They had covered the last 300 miles over water on one motor, risked death landing on a field made soggy by the first rain in seven months. Said sandy-haired Lieutenant Scott: "We've had a devil of a trip." But they had flown 9,000 miles in two days, had broken the England-Australia record of 162 hr. in the unbelievable time of 52 hr. 33 min., were only 2,000 miles from their goal at Melbourne. 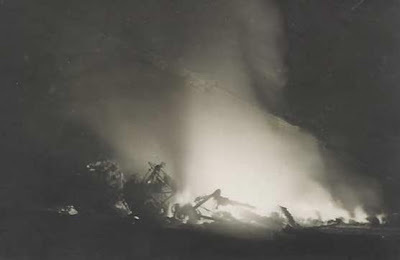 First fatality of the race brought Death to two Britons, Flying Officer Harold D. Gilman and Amateur Pilot James Baines. Bad luck had plagued them from the start. Taking off from Rome, 10,000 miles behind the race leaders, they crashed near Palazzo San Gervasio, were burned beyond recognition. Scott & Black, keeping up their sensational pace, flashed into Charleville, refueled, sped toward the finish where waiting thousands cheered their progress, reported over loudspeakers. With one motor dead, with only two hours sleep since leaving England, the Britons triumphantly set their scarlet torpedo down in Melbourne at 3:34 p.m. In 71 hr. 1 min. 3 sec. - just under three days - they had flown halfway around the world. It was a truly remarkable achievement by Tom Campbell Black and his co-pilot, Charles Scott. They conquered extreme exhaustion to win the race. By the time they reached Charleville in central Australia, Scott was so tired that he had to be helped from the aircraft and led to the terminal, shown below. Black and Scott were desperate to get away, as the KLM DC-2 was close on their heels, but both cylinder heads of their engines had to be replaced. While mechanics worked frantically, the two had a quick meal, then took off again. Both were so tired that they tried to take half-hour turns at the controls, allowing the other to sleep, but even this proved impractical. They ended up each flying for ten minutes at a time - all they could handle. On arrival at Melbourne they had to fly over Flemington Racecourse, where 100,000 people had assembled to greet them, and pass between two pylons at less than 200 feet altitude. They then flew on to an airstrip at Laverton, where they landed. The scene at Flemington Racecourse was long to be remembered by everyone there, and indeed is still remembered. Ruth Church, who was then a girl, recalls that the air was electric with excitement as that little red plane shot over our heads. A roar went up from the crowd and every man threw his hat into the air. In the distance the crowds, happily chanting and singing, saw the Moth land and its occupants alight and transfer to a procession of cars already lined up and waiting. In the first car were Scott and Black, both looking grimed and slightly dazed but still upright, and they made their way to the dias where the Lord Mayor, Sir Harold Gengoult-Smith, began the formal welcome, "You have thrilled the world, and earned the Empire's admiration and Australia's homage". Congratulations poured in from all over the world. A telegram from King George V read: "The Queen and I warmly congratulate you both on your wonderful feat. We are very glad we saw you at Mildenhall before setting out on your great adventure, and trust that you are not unduly tired after the strain of the past few days." The most dramatic part of the race was when the 'Uiver', hopelessly lost after becoming caught in a thunderstorm, ended up over Albury, New South Wales. The townsfolk responded magnificently - a postal clerk, Mr R. J. Turner, went to the power station and signalled "Albury" to the plane by turning the town lights on and off, and Arthur Newnham, the announcer on radio station 2CO Corowa, appealed for cars to line up on the racecourse to light up a runway for the plane. The plane landed, and next morning was pulled out of the mud by locals to fly on and win the handicap section of the race. In gratitude KLM made a large donation to Albury Hospital and Alf Waugh, the Mayor of Albury, was awarded a title in Dutch nobility. This incident had a lasting effect on the residents of Albury. They bought a derelict DC-2 and set it up as a permanent memorial, and it's currently undergoing restoration. The video clip below shows their memory of what happened that night. 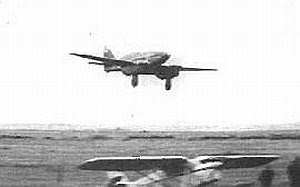 The DC-2 finished second in elapsed time, and first on handicap. As per the rules of the race, the pilot had to choose which prize to accept. Given that first prize for a handicap win was £2,000, while second prize on elapsed time was £1,500, it didn't take long for Captain Parmentier to choose the handicap prize! The next entrant to finish was Roscoe Turner in his Boeing 247D, and he took the second-place prize for elapsed time. 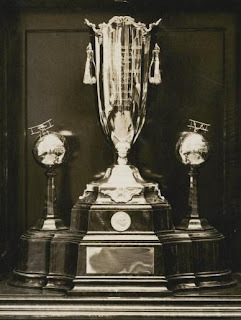 It was very significant that the second and third places had been taken by commercial airliners, not specialized racing aircraft like the winner. This showed the enormous progress in aviation that had been made in America, and was a boost to both Douglas and Boeing in their efforts to sell modern aircraft to the airlines of the day. Eventually nine of the twenty entrants were to reach Melbourne inside the sixteen-day deadline to complete the race. Three more arrived after the deadline, and were not counted as official finishers. Five withdrew due to problems of one sort or another. Three were damaged or destroyed in crashes, with two fatalities and four people (including two bystanders) seriously injured. A number of the aircraft that took part in the MacRobertson Trophy race are still with us. The winning aircraft, DH.88 Grosvenor House, has been restored, and is today owned and operated by the Shuttleworth Collection in England. It still puts on taxiing demonstrations, but can't fly at present because the runway at Shuttleworth's present airstrip is too short. It's being extended, so the odds are good that Grosvenor House will soon be in the air again. She's shown below at a previous Shuttleworth flying demonstration. Another DH.88, Jim Mollison's and Amy Johnson's Black Magic, was shipped to Portugal after the race. It was recently rediscovered there, and is being restored. Hopefully this classic racer will share the skies with Grosvenor House soon. The DC-2 Uiver crashed some time after the race, killing all aboard. However, KLM operates another DC-2, the only one still in flying condition anywhere in the world, which has been restored to a duplicate of Uiver. A video clip of it flying can be seen here. The DC-2 was to give rise to the DC-3, perhaps the most important transport aircraft in history, given its role in World War II. Likewise, the Boeing 247 was to influence the design of the B-17 Flying Fortress, which equipped the USAAF during World War II in both the European and Pacific theaters of operation. From casual beginnings, as an extra attraction in the Melbourne Centenary celebrations, the MacRobertson International Air Race grew into the sporting event of the century. Nothing of a similar nature before or since has received so much newspaper and wireless coverage. A trial of strength on the grand scale, it had attracted all the legendary pilots of the day; Jim Mollison, Amy Johnson, Ray Parer, Jacqueline Cochran, Colonel Roscoe Turner, as well as the winners Scott and Black. The public, encouraged by enthusiastic Press panegyrics, came to expect miracles; and for once they were not disappointed. This race had everything: drama, suspense, comedy, tragedy and, above all, speed, as every existing record was broken by seemingly impossible margins. Douglas and Boeing aircraft, which held their own with the racing Comets, demonstrated that flying was no longer a dangerous, arduous sport for irresponsible speed-addicts, but safe, practical and very fast. 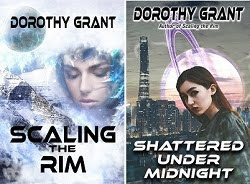 In a few days the world had shrunk to a third of its former size. "A new element," said Winston Churchill, "has been conquered for the use of man." Excellent historical post. Obviously a lot of work, well done. I have a friend who's an airplane junkie who'll love this. Thanks. Looking for information about a KLM pilot named Cornelis Blaak crashed Feb 26, 1942 in Indonesia. ref http://www.pacificwrecks.com/aircraft/dc-3/ph-afz.html web site. You know, if the fixed winglet things on the Pander S4 were ailerons, I would think that they might be opposites of the icing-prone Friese ailerons on the Junkers Tri-motor. In other words, they would have been anti-Friese ailerons! Great article. Thanks for the hard work. I think I have to agree with what Denny Goodrich said about the things referred to here as winglets. Close inspection of the photos reveal other indication of ailerons. My (somewhat educated) guess is they were in fact themselves a type of free-mounted aileron, an alternative (and possibly a better answer) to Frise ailerons, a design used on many lightplanes currently. Myself having a design with this feature I can attest it does work. Somewhat..
Basically this meant coordinated turns could be entered and exited smoothly without the need to use rudder at all. Quite a novel innovation. I wonder if they ever had it patented. Close inspection of the photos reveal other indication of ailerons. That should have read "NO other indication of ailerons". Unable to correct via editing apparently. A dumb excuse - but full marks for creativity! Who says the Civil War is over? Er . . . no, that won't buff out! 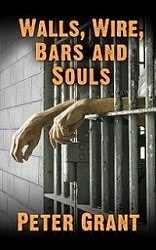 How do you punish these boys? OK, readers, put on your creative hats! Is Mexico spinning out of control? 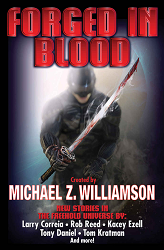 One step closer to Heinlein's "Starship Troopers"
The ultimate boy and his toy? Check that check-in counter scale! Crooks steal hi-tech, hi-tech catches crooks! Blame the cops for everything! So you want a four-wheel-drive? The curse of a lucky country? Platypus, platypus, wherefore art thou platypus? The fish that can do it all! When a mountain blows its top . . . The automotive tower of power? Q: When is a lesbian not a Lesbian? You paid $960 for a piece of poop?? ?